Tomorrow (Tuesday, January 9, 2018) the 110th General Assembly reconvenes in Nashville for the 2018 legislative session. 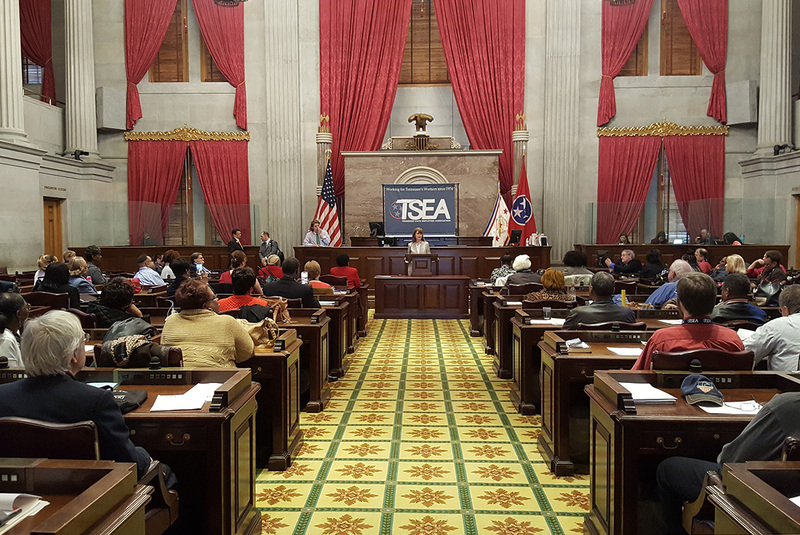 This year, TSEA is gearing up for a major grassroots campaign to help shape the debate for the 2018 elections and move the Legislature and Haslam Administration to put the issues and concerns of working Tennesseans first. • Support legislation that makes significant changes to the TEAM Act to provide state employees more rights. • Fight any effort to weaken or diminish the rights left for state employees in the TEAM Act. • Oppose any efforts that take benefits from the employees of Tennessee. • Support any effort to bring more oversight to agencies where workers are bearing more than they should. • Oppose all efforts that allow commissioners or the governor to make public policy with no oversight. • Advocate for measures that move Tennessee out of the bottom third for employee pay. • Oppose any legislation that would undermine adequate funding for government services provided by state employees. • Continue to support passage of an appropriation to give all state employees a raise. • Fight to improve wage levels for all TSEA represented agencies. • Support adequate funding for state universities. • Oppose all legislation that would have the effect of privatizing any service currently provided by public employees. • Support legislation that would establish strict accountability standards that must be met before services could be privatized. • Oppose efforts to weaken or repeal the laws that currently restrict privatization of any public services. • Oppose efforts that would further jeopardize quality public services by the reduction of employees in any state agency. • Support legislation that takes aim at unmanageable caseloads and personal safety of state employees. As TSEA members work to advance our legislative agenda we will also work to make sure that any anti-public-employee or anti-retiree legislative proposals do not become law. Members of the General Assembly are already drafting and filing legislation that will move our agenda forward. Remember, as public employees, what happens at the State Capitol during the legislative session can have a direct impact on your job. You cannot afford to ignore what happens at the State Capitol or in the political process.